A student currently working as an agricultural laborer in Vietnam’s Mekong Delta region has been admitted to college, but her family greeted this milestone with mixed feelings, fearing that they are too poor to support her continued education. Hoang Thi Dieu Hien, in rural Tien Giang Province, was filled with joy on the day she knew she can attend the University of Social Sciences and Humanities, a major higher education institution in Ho Chi Minh City. “That day she ran home from somewhere and suddenly hugged me. 'I enter college, I enter college,' she shouted,” the eighteen-year-old student’s mother, Nguyen Thi My Le, recalled. But Le, 47, was overcome with great worry. “Seeing the daughter’s happy face, I was gripped with pain in my mind. I am now nearly burned out after having paid for her to complete high school. And I've got no money for college tuition,” the single mother said. But she allowed Hien to study at the university, a hard decision that the woman reached after spending multiple sleepless nights, given her below-poverty-line family. Le has a congenital deformity in a leg, which she said has made her lag behind other workers in farming jobs. Le left her home in Tien Giang for Ho Chi Minh City to work as a domestic servant when she was young, and at 30 she got married to a local motorcycle taxi driver. After giving birth to Hien, Le brought the first-born daughter back to the hometown since she failed to earn a livelihood in the metropolis. The husband, however, then visited Le and Hien only once in many years before showing up again to persuade his wife to have another baby, to which she agreed. The man abandoned the mother and his offspring just before the second-born child turned one month old. He has not seen them for eleven years ever since, Le said. A problem the mother and her children are facing is lack of money for Hien’s studies. Le once took out a loan from a bank to raise pigs, which later died of disease. As she still fails to clear this debt, Le cannot borrow anymore. Hien applied for a job as a factory worker but she usually took out her books and laid hands on them with affection every night. “That hurt me terribly,” Le said, adding that she had on many occasions intended to burn all Hien’s certificates of academic merit but a sense of guilt ended the attempt. 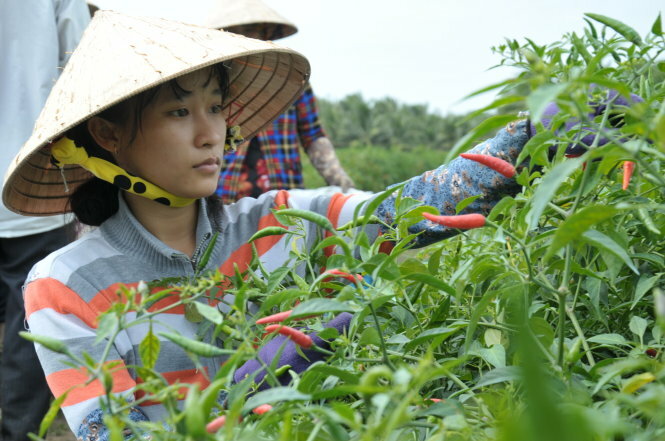 Now the mother and children have been hired as agricultural workers to harvest chili pepper. “Hien is just 18 years old but she juggles household commitments with jobs. She’s done that for more or less ten years,” employer Nguyen Van Quang said. Quang said he only hires healthy adults but he pays Le and her children the wage for ordinary grown-ups. In high school, Hien sometimes cried out of self-pity when seeing her peers pedal for fun or get to tuition classes while she was picking chili pepper in the field. “In the next days, I’m going to work day and night to earn enough money for the first-semester fees. In the following semesters, I’ll find part-time jobs in Ho Chi Minh City to pay the fees,” Hien said recently.